If you get lucky, the clothing store where you bought that new sweater or shirt might toss in the plastic hanger it was on free of charge. Otherwise, you'll have to scrounge one up yourself—at least until this wonderful redesign of the shopping back becomes a reality. With a few folds the Hangbag transforms into its own hanger, strong enough to support everything short of a lead-lined suit. The bag is the brainchild of designers Parin Sanghvi, Shruti Gupta, and Mohit Singhvi, and it takes the less-used reuse approach. 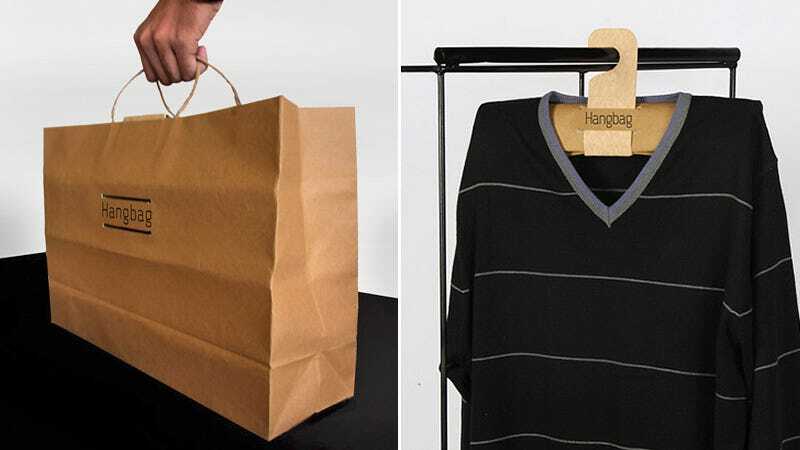 Instead of encouraging shoppers to just toss the sack in their recycling bin, it includes instructions on how to use some basic origami techniques to turn it into a very functional hanger.